Here are some Frequently Asked Questions that may guide you in preparing for your Adventure with us! 1. How strict is your age policy? Our age limits are strict. There is no deviation from them. 2. How many people fit in a raft? Normally there are 4-6 people (plus a guide) in our rafts on the Chattooga, but since the Chattooga River is a free flowing river and we have no control over the water levels, that number may change. We will not know until the day of the trip how many people will be in a boat. If you do not have enough people to fill a raft you may be combined with another group. 3. Do you have lodging in the area? We do not have lodging at our outpost, but there are lots of great places in the area that we recommend. 4. What can we bring in the raft? We do not recommend bringing anything in the raft. Some people like to attach waterproof cameras to their life jackets. If you need to bring medication, we will have a dry bag on the trip, so please advise your trip leader of this on the day of the trip. We also have a place for you to leave your car keys at the outpost during the trip. 5. What does the lunch include? Our lunch includes a buffet spread of deli/veggie choices (assorted lunch meats and cheeses) with chips, fruit, tuna, peanut butter and jelly, etc. You will make your own plate. 6. How do I know what trip times are available? Because our trip times and availability constantly change, you must call our reservation office at 1-800-868-7238 for exact trip availability. You can check in our Online Reservations to see if your desired time is available. The Chattooga season runs from March to October. The off-season is considered to be March -April and October. 8. Is there a guide in every raft? Section IV trips always have a guide in every raft. The Section III trips may have a guide in every other raft in the off-season. 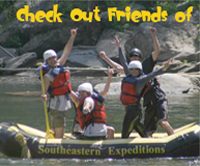 We are the only company who offers a guide in every raft on the Chattooga III trips during the summer months. All cancellations of prepaid spaces are fully refundable up until 30 days prior. Within 7-29 days of the trip spaces are 50% refundable. There are no refunds on spaces inside 7 days of the trip date. 10. How strict is your cancellation policy? Because the Chattooga River is highly regulated with limited capacity, our cancellation policy is very strict. 11. Do I have to make a reservation? RESERVATIONS ARE RECOMMENDED. The Chattooga weekend trips may book up months in advance depending on the weekend. We do accept walk-ups if there is space available on the day of the trip.We have an easy online Reservation system – click here! 12. What is included in the price of my rafting trip? All your gear and equipment, your guide, taxes and fees, and your lunch if you are on a full-day trip. 13. Can I bring my dog in the raft? We do not allow pets in the rafts or at the outpost. 14. Do you have a babysitting service for the younger children? Sorry, we do not provide those services. 15. What should we wear on our feet? Old tennis shoes, river sandals, or water shoes are fine. No flip-flops please. 16. Will I fall in? We do our best to keep all rafters inside the raft. However, we cannot guarantee anything, and there is always a chance of falling in. We do our best to get you back in the raft as quickly as possible. 17. Do you rent duckies, rafts, kayaks, or canoes? We do not rent any gear or equipment. 18. Do you have concessions at the outpost? Yes, we have snacks and drinks in the outpost store. 19. Can I buy photos of my trip? We pride ourselves in providing some of the best photography on the river. Most trips have a photo-boater, who is dedicated to taking multiple shots at multiple rapids. There will be a photo show following your trip. You can either purchase prints directly from us or buy a photo CD. We hope our photography provides our customers a chance to get great family and group photos to remember your adventure. 20. Do you have showers at the outpost? Yes, we have a changing area with hot showers and bathrooms, so please feel free to bring a change of clothes and a towel. 21. Do we end where we start? No, you will meet at our outpost and ride up to the put-in location on our bus. The bus will pick you up at the end of the trip and bring you back to your car at the outpost. 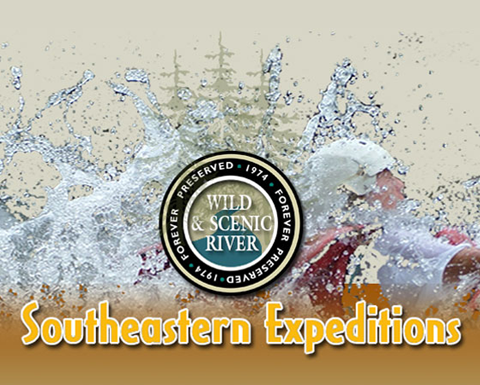 Southeastern Expeditions takes pride in our safety record. We have been in the commercial rafting business for over 30 years. All of our guides must go through an extensive training process and are CPR and First Aid certified. However, there are always risks involved with adventure activities such as whitewater rafting, and you will be asked to sign a waiver prior to your trip. 23. What if it rains? The trip will go rain or shine. If we do cancel a trip for inclement weather or abnormal water levels we will either refund your money or reschedule the trip. 24. What else is there to do in the area? The Chattooga is located in a very scenic area. There are lots of scenic hikes, waterfalls to visit, fishing, camping, horseback riding, and bike riding. There is shopping and dining in Clayton, GA. Please visit our Chattooga links page for local attractions.